For anyone still shaking their head over the recent eye-popping, one-way trends in the stock market, the academic assessments of “herd behavior” above may provide one of the best summations I’ve seen. Blame It On The Computers? To be clear, I have never been involved with a high-speed or high-frequency trading shop. As such, I have to admit that I do not know all the ins and outs of how today’s algorithmic trading programs function – or even what triggers them. However, I have done a fair amount of research on the subject and as such, I am pretty confident that algo-induced herd behavior had a hand in both the slow-motion crash that occurred between 12/4 and 12/24 and the ensuing joyride to the upside that began on 12/26. The NAAIM Indicator Wall provides a weekly update to a robust array of stock market indicators. The “wall” includes readings and explanations of indicators and/or models in the areas of price/trend, momentum, key price levels, overbought/sold readings, sentiment, monetary, economic, inflation, and market cycles. 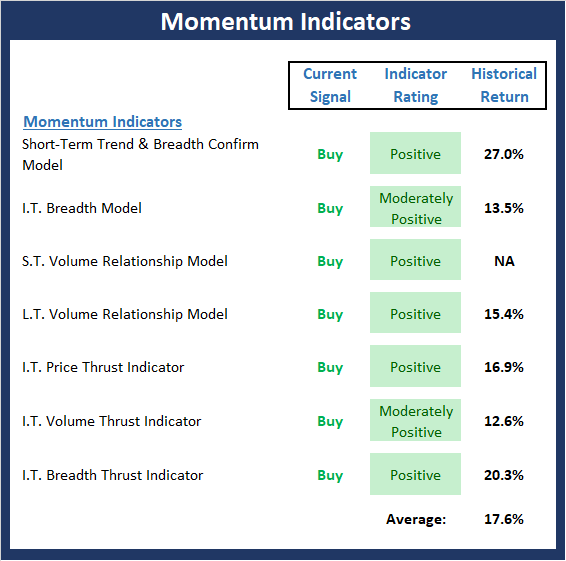 This week, we’re featuring the Market Momentum Board, which is a group of indicators and models designed to tell us whether there is any “oomph” behind the current trend.. 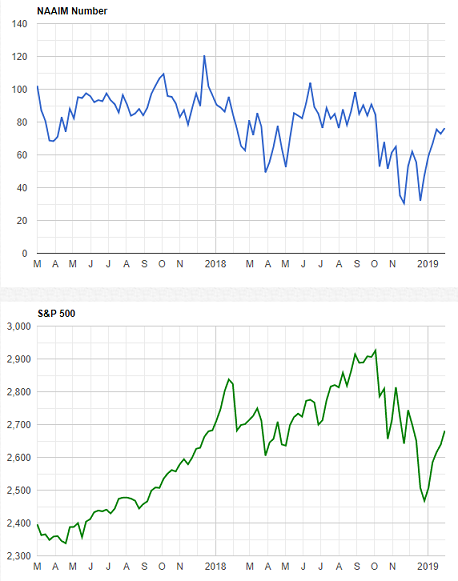 The fact that the Momentum board is awash in green this week is an excellent indication that the recent rally, which has gained more than 15% in just 5 weeks, definitely has some oomph behind it. This may be due to the abrupt change in the Fed’s policy or the increasing hopes for a trade deal with China. 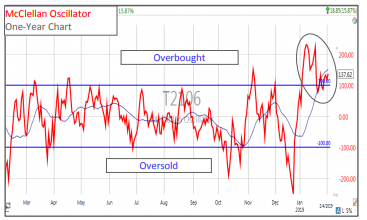 But in any event, the momentum favors the bulls and suggests a buy-the-dip environment has returned. Note: The Indicator Wall is a benefit provided to NAAIM Members and is password protected. To obtain a temporary password, contact NAAIM at 888-261-0787. We have a small economic calendar, but another big week for earnings. Corporate earnings are not confirming those who thought the market was signaling a recession. Starved for something new to worry about, the punditry has turned to reductions in earnings estimates. This newfound interest in forward earnings provides another dimension for the gloomy set. Instead, I suggest that astute investors should consider the data while… looking beyond the obvious. Using earnings season as the main theme, I will suggest some easy ways to accomplish this goal. Use Expected Earnings: The most compelling reason is that it works better than either current earnings or formulaic analysis of past earnings. As earnings season unfolds, you see plenty of emphasis on guidance and outlook and little discussion of things that happened ten years ago. If this is how the market evaluates individual companies, why should we expect a different approach to the resulting broad averages? 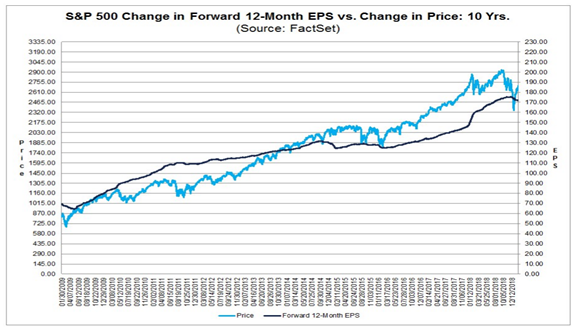 FactSet regularly runs this chart which shows the relevance of forward earnings for markets. Note that it is a constantly moving 12-month forward look, not the fixed calendar approach used by most sources. market to name a few. 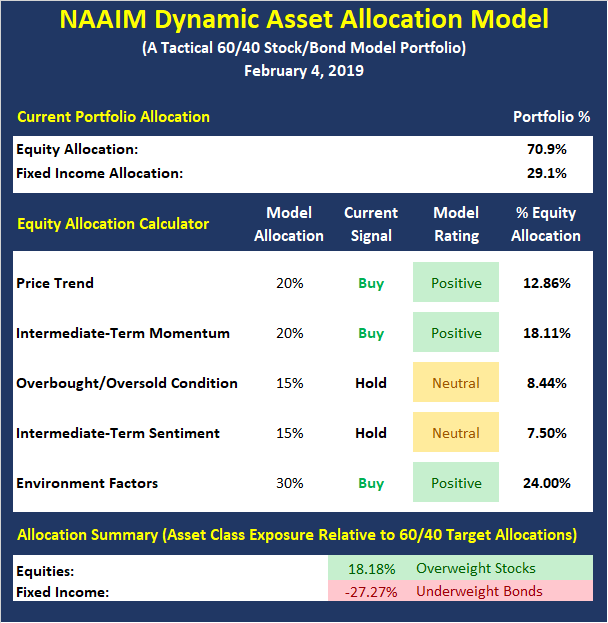 Designed to be a value-add benefit to membership, NAAIM offers a Dynamic Asset Allocation Model based on the NAAIM Indicator Wall of indicators and models. The overall objective of the model portfolio is to dynamically adapt to changing market environments and to keep equity exposure in line with current conditions. The model targets a normalized allocation of 60% stocks and 40% Bonds. The model has been run live on the NAAIM website for several years and has demonstrated the ability to reduce exposure to market risk during negative environments such as those seen in 2015-16 and 2018. COMING SOON: The model is currently shown within the NAAIM Indicator Wall but will soon be an option in the “Programs” Tab of the NAAIM.org website. The NAAIM Dynamic Allocation Model is for illustrative and informational purposes only, and does not in any way represent an endorsement by NAAIM or an investment recommendation. The Fed released a dovish (low rates) policy statement on Wednesday and the market shot higher in price on above-average volume! I now have conviction that the institutions “big money” is coming back in this market after being on “pause” since the Fed’s rate hike in December. The Fed mentioned “patience” eight times in its policy statement signaling that it may have raised rates in December prematurely. The market seems to like the new “tone” of the Fed. I believe the Fed has re-filled the “party punch bowl” sending a signal to the market that QE is not dead and it is very much still alive. After the worst December performance since the Great Depression, the market has turned in one of the best January’s in recent memory. 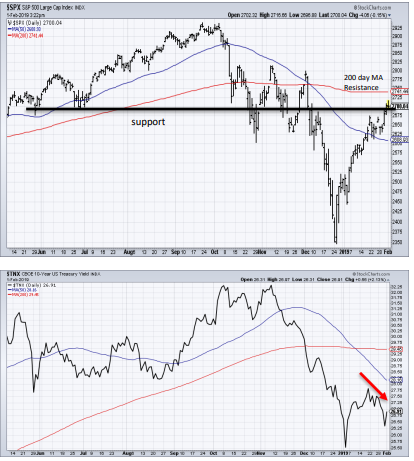 The rise has continued unabated with virtually no pullbacks or rest to allow those that were out of the market in December a reasonable opportunity to move back into the markets. The market has been fueled by optimism that a trade deal with China is moving in the right direction and, more importantly, a suddenly dovish Fed sounding like there are no more rate hikes in 2019. 6 weeks ago the Fed was contemplating 2-3 rate hikes in 2019. It has been a remarkable 180 degree turn by the Fed that caught many off guard – us included. The NAAIM Exposure Index represents the average exposure to US Equity markets as reported by our members in the organization’s weekly survey. Note that many NAAIM members are risk managers and tend to reduce exposure to the markets during high risk environments. For example, at the beginning of October, with the stock market near all-time highs, the NAAIM Exposure Index stood at approximately 90%. However, by the end of November – and before December’s precipitous drop – the exposure index had dropped to 53.2%.